Resolution Interactive will release a new game for iPhone - Clusterball 2. It will be avaliable in AppStore. Simplify Media for Mac/PC is a free download. Only the first 100,000 copies of the iPhone version are free to download, after that it will be $3.99. Good news everyone. Thanks to Google you can now use search on Java4iPhone. Use the form in the right top corner. There was a post about Qik:Broadcast video live from iPhone. At that time only users of old iPhones with firmware 1.1.4 could use it. Now there is a new version for 2.0 users. If you have not already, you'll need to sign up at http://qik.com/sign_up and receive an SMS from us to activate the application. Go to the "Sections" tab at the bottom and scroll down to "Multimedia." Under Multimedia, you will find Qik. Tap on it then select "Install" at the top right, then in the same spot tap "Confirm." Now you will see Qik get installed. You may hit the "Return to Cydia" button at the bottom or just quit Cydia when it is done installing. 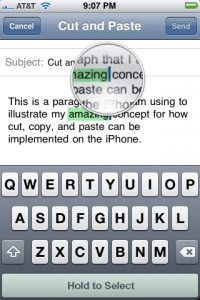 You'll now notice a "Qik" icon on your home screen - Go ahead and launch it. As long as your initial signup SMS/text message is still in your inbox for the first launch, your account will be linked to your device. Make sure you have 3G service or are on WiFi (edge is not sufficient enough to stream video) before you begin broadcasting. Hit record and enjoy Qik! ZDNet Australia reports that banking "giant" HSBC is considering ditching the BlackBerry and switching over to the iPhone for its staff. HSBC has about 300,000 staff worldwide and this transition could result in 200,000 iPhone orders. "We are actually reviewing iPhones from a HSBC Group perspective ... and when I say that, I mean globally," HSBC's Australia and New Zealand chief information officer Brenton Hush told ZDNet.com.au yesterday. iLightr is a virtual cigarette lighter for iPhone and iPod touch that is available in the App Store now. 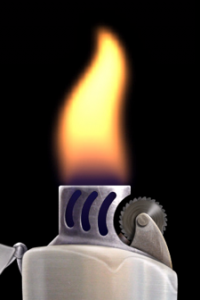 It's only US$0.99 and is an amazingly good simulation of a lighter. Next time you're at a concert and just gotta have an encore, don't pull out a cigarette lighter. Instead, launch iLightr! This 40-minute talk by Neil Young, CEO of ng:moco, makes a compelling case for the iPhone as the industry’s next dominant gaming platform. The address took place at iPhoneDevCamp 2 in San Francisco earlier this month. The app, which costs $6.99, turn your iPhone into an easy-to-use wireless storage device that can be access by any other device on your wireless network. A one way drop box can be added to a normal machine to drop files onto the iPhone, or alternatively you can set up a two-way shared drive to move files between the iPhone and a computer. More info on developer's website. Rip Dev team, the developers of Installer for iPhone, created a separate blog: ripdev.org. There are couple posts already about repositories. This application is well known to many iPhone users. This application is feature rich, allowing you to take and send images or IM a phone number from any of your 10 supported IM accounts. Application cost is $2.99. PS: I personaly like Agile much better. NEW YORK (AP) -- Best Buy Co. will start selling the iPhone on Sept. 7, becoming first U.S. chain to do so outside of Apple Inc.'s and AT&T Inc.'s own stores. 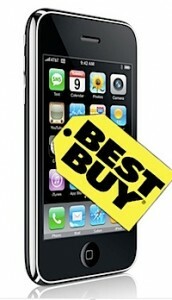 The announcement by Best Buy expands the availability of Apple's vaunted phone to 970 full-size stores and 16 smaller Best Buy Mobile stores. It's also a coup for the Minneapolis-based chain, which has been upgrading its cell-phone departments. Last week, Best Buy announced it had completed a two-year conversion of its stores to include upgraded cell-phone departments under the Best Buy Mobile brand. It has upgraded its computer systems to handle cell-phone activation and spent 250,000 hours training its employees. We all saw iPhone 3G "twice as fast" adv video. The funny thing is that in real world everything is much slower than in advertising. However new iphone 3G is really faster than the old one: EDGE vs 3G. David Friedman writes in to let us know he’s thrown his hat into the ‘This is how I think Apple should implement cut-and-paste’ ring. His idea is simple, intuitive, and doesn’t look to interfere with the current magnifying glass insertion point UI. Here it is in a nutshell — when you have the magifying glass up, there’s a button you can press to toggle the various things you need for cut and paste — select, cut, copy, and paste. David recommends that the options shown would be contextual based on whether or not you have anything in your clipboard. When you’re in a text-entry field, that toggle button would appear in place of the space bar area at the bottom, while areas with text that lack text entry (like Safari) would need an unobtrusive button to appear when in the text-selection mode. Compatible with the current UI. In fact, it’s consistent and keeps the current text-selection metaphor of the UI intact. It just adds to it.